Sub-Saharan Africa is home to many of the world’s longest-ruling heads of state. Some postcolonial leaders in the 1960s and 1970s sought to become “president for life,” with several managing to remain in power for three or more terms. By the turn of the twenty-first century, the trend of entrenched leadership had spread across the region, spurring corruption, instability, societal fractures, and economic stagnation. But the trend may be reversing, in part due to sustained pressure by civil society groups and regional blocs. How prevalent is this trend? Many African countries struggled with transfers of power in their first half century after independence. Leaders who gained recognition during national movements for independence consolidated power and bound their own positions in office with their countries’ national identities. By early 2019, three African heads of state had been in power for more than three decades each: Teodoro Obiang Nguema Mbasogo in Equatorial Guinea, Paul Biya in Cameroon, and Yoweri Museveni in Uganda. More than a dozen other African heads of state have been in power for at least ten years. In August 2017, Angolan President Jose Eduardo dos Santos stepped down after thirty-eight years in office, and in November of that year, Zimbabwean President Robert Mugabe was forced from office after thirty-seven years by a military coup. Military coups were once common [PDF] as a means to seize power, with both Mbasogo and Museveni entering their presidencies this way. They have declined during the last two decades; there were twenty-seven successful coups from 1970 to 1982, but only twelve from 2000 to 2012, and just the one against Mugabe since then. What has been its impact on growth and stability? Zimbabwe. Once one of the continent’s richest nations, Zimbabwe tumbled under Mugabe to a place of chronic underdevelopment with a long-struggling economy. Mugabe’s alleged misuse of federal funds has been linked to underfunded and dysfunctional government departments and programs. In the wake of a slew of constitutional amendments granting Mugabe broad power, the country experienced drops [PDF] in life expectancy and per capita income between 1990 and 2005. Economic instability has continued under Mugabe’s successor, Emmerson Mnangagwa, with a severe currency crisis prompting widespread protests in early 2018. Democratic Republic of Congo (DRC). Under the three-decade-long dictatorship of Mobutu Sese Seko, the DRC suffered from gross corruption, embezzlement, and neglect of public infrastructure. An economy based almost exclusively on mineral extraction deteriorated as Mobutu forced out foreign-owned companies and embezzled government funds. Laurent Kabila overthrew Mobutu in 1997 but was assassinated in 2001; his son, Joseph, succeeded him, amassing a fortune by stealing state funds and effectively disregarding the provision of public services. A war in the country’s east, considered the world’s deadliest conflict since World War II, continued under his presidency. Kabila stepped down after a December 2018 election, two years after his mandate was set to end, though election observers and many opposition leaders questioned the vote’s legitimacy. Sudan. Omar al-Bashir came to power in a 1989 military coup that ousted the democratically elected prime minister. He has remained in office ever since despite allegations by international and domestic observers of widespread electoral irregularities and fraud. He presided over a decades-long civil war that ended with the south seceding to become the new state of South Sudan in 2011. Bashir was indicted by the International Criminal Court in 2009 on charges of war crimes and crimes against humanity for involvement in attacks on civilians in Darfur. Protests sparked by the rising price of bread in late 2018 called for Bashir to step down. Meanwhile, lawmakers began considering an amendment to extend term limits. Rights abuses in the countries with the longest-serving leaders have included secret or arbitrary arrests and detentions, tight restrictions on freedom of expression, and police brutality, according to monitoring groups. Human Rights Watch reported that the humanitarian situation in Burundi “remains dire” nearly four years after President Pierre Nkurunziza’s decision to run for a third term sparked mass protests. It accused the security services and the ruling party’s youth league of widespread abuses ahead of a May 2018 referendum to lengthen presidential terms. Why has the problem persisted? Leaders are increasingly securing longer terms through “constitutional coups,” proposing amendments for approval by the legislature or judiciary, or in national referenda, that allow for additional terms in office. This practice grew more frequent after 2000, when many postcolonial leaders were nearing the ends of their constitutional term limits. Since then, at least seventeen heads of state have tried to remain in power by tweaking their countries’ constitutions. Namibian President Sam Nujoma did so in 1998, followed by Gnassingbe Eyadema, the president of Togo, in 2002. One year later, the Gabonese parliament voted to remove term limits from its constitution, allowing President Omar Bongo to run for a sixth term. Following these initial instances, attempts to extend terms became fairly regular occurrences, popping up every one to two years on the continent in countries including Angola, Burkina Faso, Burundi, Cameroon, Chad, Djibouti, Equatorial Guinea, Guinea, Niger, Nigeria, the Republic of Congo, Rwanda, Senegal, Sudan, and Uganda. Since , at least seventeen heads of state have tried to remain in power by tweaking their countries’ constitutions. Angola’s dos Santos and former Senegalese President Abdoulaye Wade, among others, claimed they were eligible to run for additional terms because the constitutions containing term limits were passed during their mandates; they argued the limits should only apply to future presidential terms. Burundi’s Nkurunziza made a similar claim in 2015, saying that his first term, which he won in a parliamentary vote rather than a popular one, did not count toward the limit. Uganda’s Museveni paired the elimination of term limits with the introduction of multiparty politics to pass a constitutional amendment in 2005, and his party eliminated the presidential age limit in a 2017 amendment. Many experts say that countries lacking an effective political opposition are vulnerable to constitutional coups. 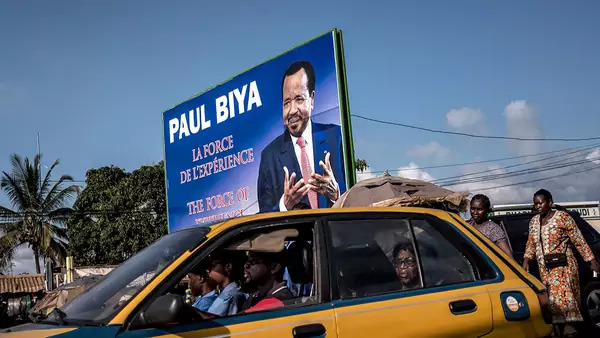 Though several countries across sub-Saharan Africa tout themselves as multiparty states, some, including Cameroon and Rwanda, remain de facto one-party states. Rwanda’s Paul Kagame, who has effectively been the country’s leader since 1994, secured another seven-year term in August 2017, with the electoral commission reporting he had the support of almost 99 percent of voters. “Executives are able to act with impunity because there is no strong, organized opposition to challenge entrenched incumbents and push them toward a genuine political opening,” American University’s Adrienne LeBas writes [PDF] of these countries. Kleptocratic incumbents have even more incentives to stay in office; they could lose their wealth if they were to lose power and potentially face prosecution. The network of businesses that Kabila and his family have built in and beyond the DRC has brought them hundreds of millions of dollars. Angola’s dos Santos was long accused of funneling government funds to a small group of elites, as well as to his own family. His daughter Isabel, the wealthiest woman on the continent, was named head of the state oil company by her father in late 2016. “Very few African countries—in fact almost none—have any kind of pension or security scheme for former presidents or heads of state. So out of power means out of money,” Anneke Van Woudenberg, then Human Rights Watch’s deputy director for Africa, told Newsweek. Dos Santos’s successor, former Defense Minister Joao Lourenco, pledged to crack down on corruption; he removed Isabel dos Santos from the national oil company, and her brother, Jose Filomeno dos Santos, as chair of the country’s sovereign wealth fund. Mugabe has called the push for term limits a Western attempt to “place a yoke around the necks of African leaders,” and some politicians who concur with him point to Western democracies, including the United Kingdom and Canada, that have no such provisions. When have leaders failed to extend their rule? Zambian President Frederick Chiluba’s and Malawian President Bakili Muluzi’s proposals to raise presidential term limits in 2001 and 2003, respectively, were stopped after opposition and civil society groups formed alliances with lawmakers from the countries’ ruling parties. In 2006, Nigeria’s senate rejected an amendment put forth by President Olusegun Obasanjo that would have allowed him to serve a third term. Citizens have often opposed constitutional coup attempts through protest, at times successfully blocking them. In 2012, large protests in Senegal led to an electoral defeat for Wade, who was running for a disputed third term. After weeks of demonstrations in October 2014, Burkinabe citizens stopped Blaise Compaore from repealing the constitutional provision on term limits and forced his resignation. 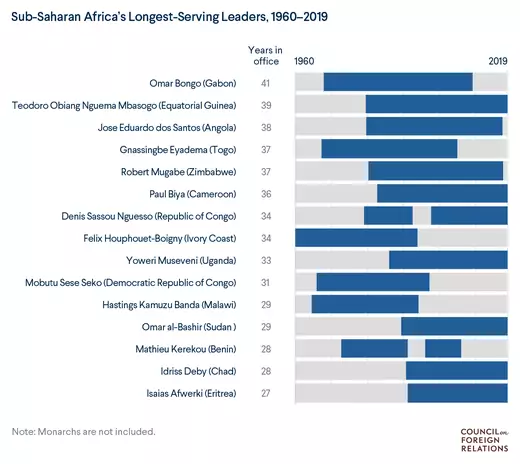 Polling by Afrobarometer found that roughly 75 percent of citizens surveyed in thirty-four African countries between 2011 and 2013 believed leaders should be limited to two terms in office. Gambia’s small size and geography conspired against former President Yahya Jammeh, who ruled from 1994 until his ouster in 2017, argues Virginia Comolli, a senior fellow at the International Institute for Strategic Studies. The country is surrounded by Senegal, which supported opposition candidate and election winner Adama Barrow. How have regional and international actors responded? The African Union (AU), which has prevented some military coups by threatening countries with suspension, sanctions, or military intervention, has been criticized for not taking similar actions against attempts at extending presidential terms. In 2012, the AU ratified the African Charter on Democracy, Elections and Governance [PDF], which calls on its member states to identify illegal means of accessing power or staying in office, including refusals “to relinquish power after free, fair, and transparent elections” and constitutional amendments that infringe upon “the principles of democratic changes of power,” and sanction those responsible. In January 2017, the AU stated it would not recognize Jammeh, who lost the 2016 election but nonetheless attempted to stay on. The West African bloc ECOWAS has also become active in some cases. A military offensive by ECOWAS troops forced Jammeh to step down and leave the country. The body often deploys observers to help ensure free and fair elections in the region; in 2019 it sent observers to Nigeria and Senegal. ECOWAS leaders discussed a proposal to ban presidents from seeking third terms at a 2015 regional summit, but the bloc postponed a decision due to opposition from Togo and Gambia. The United Nations and European Union have imposed sanctions on several African countries, including Burundi, the DRC, and Zimbabwe, in response to impeded political transitions or fair elections. The United Nations endorsed ECOWAS military action in Gambia and threatened sanctions if Jammeh refused to leave. Millions in EU development aid to Gambia was frozen in December 2014 due to human rights concerns under Jammeh; following Jammeh’s departure, the bloc released the funds. What is U.S. policy toward extended mandates? Democracy promotion has long been a U.S. priority in the region. President Barack Obama said in a 2012 brief on U.S. strategy in sub-Saharan Africa that the United States would “not stand idly by when actors threaten legitimately elected governments or manipulate the fairness and integrity of democratic processes.” In an address to AU leaders three years later, Obama urged the body to ensure that heads of state comply with term limits. It remains to be seen how closely President Donald J. Trump will adhere to that precedent. His administration has said it will not “subsidize corrupt leaders and abusers of human rights” on the continent, but a new Africa strategy outlined in late 2018 marked a shift in priority from democracy advancement to countering China and Russia in the region. The United States has imposed economic sanctions, including bans on travel to the United States and business transactions with U.S. nationals, on individuals who “undermine democratic processes.” The United States issued sanctions against Mugabe [PDF] and other Zimbabwean officials in 2003. The Obama and Trump administrations have sanctioned top officials from the DRC since Kabila refused to schedule an election in late 2016. Ahead of Nigeria’s 2019 election, the United States and United Kingdom jointly announced they would deny visas to Nigerians involved in vote rigging or electoral violence. At the same time, analysts contend that the United States has often prioritized security interests over concerns about prolonged rule. Washington has chosen not to penalize long-serving leaders of partners, such as Cameroon, Chad, and Uganda. And in the DRC, CFR’s Michelle D. Gavin points out, Washington accepted disputed 2018 election results to avoid further instability. The U.S. military trains partner nations’ military forces, shares intelligence with them, and helps their troops combat Islamist rebel groups on the continent, including al-Shabab in Kenya and Somalia and Boko Haram in Nigeria. Brittany Brown contributed to this report. African Center for Strategic Studies Research Director Joseph Siegle urges Western governments to impose sanctions against African leaders who subvert democratic processes and suspend aid to their countries. CFR’s Sub-Saharan Security Tracker maps instances of political violence across the continent. Countries where attempts to extend presidential terms are contested can expect uncertainty, argues Northwestern University’s Rachel Beatty Ried. George F. Ward discusses how Zimbabwe can prepare for a post-Mugabe government in a CFR Contingency Planning Memorandum. Jammeh’s forced exit from Gambia is the latest indication that the push for democratization on the continent remains strong, argues David Pilling in the Financial Times. CFR’s John Campbell recommends that the Trump administration establish interagency working groups to help African countries combat kleptocracy.